Thrush is caused by the Spherophorus neaophorus – a fungal organism which eats away at the underside of the hoof around the frog. Hoof thrush is characterized by the presence of dead, black, and foul smelling material in the affected areas. 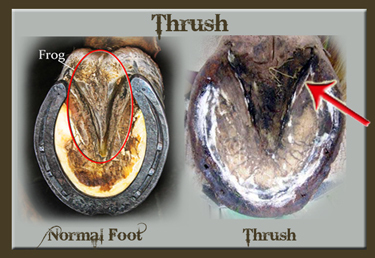 An infection of thrush can be painful and cause your horse to go lame. While there are many products available on the market to treat thrush in horses, we've selected a few of the best treatments on the market for thrush treatment. Below are our top picks in horse thrush treatment products. Thrush flourishes in confined dirty conditions, therefore, standing on a dirty wet floor speeds infection. Good stable management, and good hoof care from your farrier can prevent this unpleasant condition. Cleaning hooves on a routine basis; providing adequate exercise; proper nutrition and supplementation to help create denser and healthier frog and sole tissue; and regularly applying a non-caustic hoof topical or clay to maintain a healthy hoof. If you feel your horse's hooves can benefit from hoof packing due to consecutive days of jumping as is common with the training of hunters, jumpers, and three day eventers we've got you covered. Do you live in a hot, dry climate or desert region? Horses living in such climates can end up with excessively dry hooves which can crack and chip, in which case your horse can benefit from a hoof conditioner.